The aerofoil fan and the air ducts cool down the grain moving the air at low speed keeping the grains at a proper temperature avoiding wet and dry heating. Axial fans with 220V single phase and 380V three-phase source. 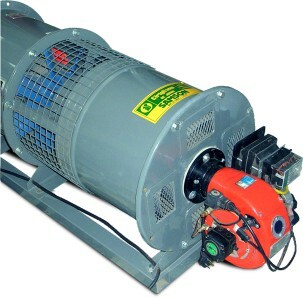 Gasoline explosion engines for high powers and diesel engines with auxiliary PTO tractor engine. Avoid costly transile operations and save more than 8%, avoiding damages in badly preserved grains. Storage and ecological static drying systems manufactured by CIRIGLIANO are the most effective option to make your efforts count. Harvest, store and dry the cereal in your own field, with the minimum cost of short freight and sell it when you decide. Normal Ventilation: It receives the dried cereal by the drier and keeps it for up to 2 years. The applied air volume is required to produce an air speed from 0,3 to 1 meter per minute in the grain mass. Reinforced Ventilation: It receives the cereal with the 24% of humidity and conditions it for the dryer. It stabilizes the moisture and temperature achieving a steady performance in the dryer. The volume of air applied is required to produce an air speed from 1.2 to 4.5 meters per minute in the grain mass, reducing the moisture at 0.5 per day. Cooling: It receives the hot cereal from the dryer (50%) and cools it in 15 hours completing the drying cycle. It increases the performance of the dryer up to the 50%. It reduces the broken loss. It keeps the natural brightness with high market values. The volume of air applied is required to produce an air speed from 4.5 to 20 meters per minute in the grain mass. flat floor and wire silos.